NiCK'S SANCTUARY: A Suspicious Package - Fancy a Fling? 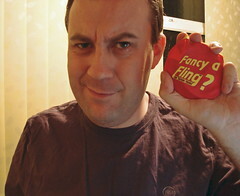 A Suspicious Package - Fancy a Fling? First things first, this has absolutely nothing to do with the recent letter bomb attacks across the UK. They are going to be deeply disappointed . Scroll down to the next post to see what was inside (our dumb home computer keeps opening up two windows for photo uploads and blogger can't cope, so I'm having to go through flickr).